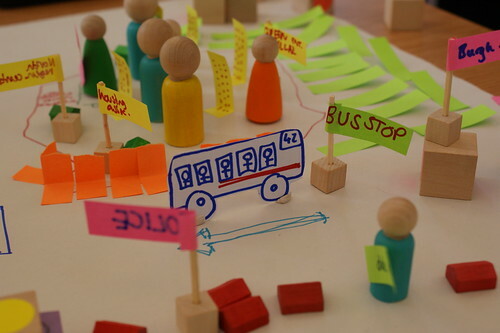 It was great to be introduced to the concept of ‘asset mapping’, a positive way of looking at your community and all the great things in it, we worked in teams to map areas in Glasgow. My team focused on Maryhill, with a great starting point, ignoring Tessy’s instructions (yes, we were the naughty group) to not start with roads, and start with assets. Mapping in this three dimensional way, allowed us add in emotional factors to the map. My favourite observations was the bus as a new local meeting point since the schools had closed down and parents took their kids to new schools, and the ‘animosity’ markers which showed communities who didn’t get along with one another. This proved to be a fantastic way of visualising a community, and a great activity that could be done co-creatively with lots of different participants. It could show networks, relationships, traffic flow (both car and people). What a fantastic way to understand a community and pool local knowledge of an area together. 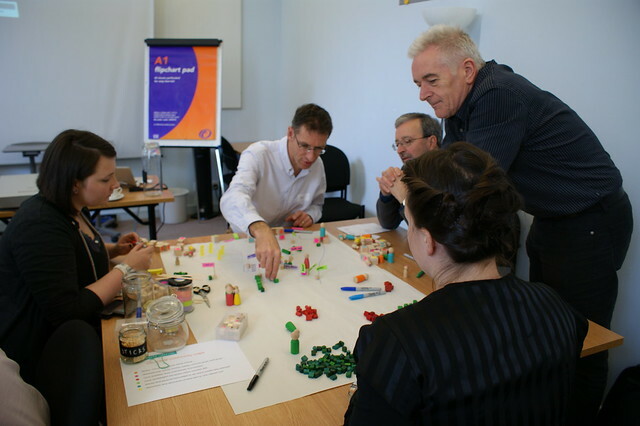 Another exercise we undertook was to think about what community was, what it was missing. We used Lego, and If you know me, I can become far too excited about it. 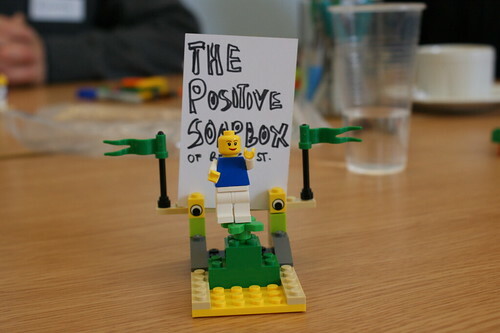 Some may think it’s silly, but Lego is a fantastic way of communicating thoughts, and my favourite model was a contorted, ‘angular’ model from a participant at my table who had built it this way to display the complex, twisted relationships in a community. The use of Lego, which is often a technique used in my work got me thinking about how everyone can participate in the design process. Lego brings tangibility to often difficult to express concepts, (in my line of work, services). I have practiced for years and can prototype and bring to life concepts with my hands in seconds. It was Marty Neumeier who said in his book, The Designful Company, that as designers, we are the link between thinking and doing, our hands, are the link between thinking and doing. We make with our hands, iteratively, and that is a very important thing to remember, a designer possesses the ability to prototype quickly, at an expert level. But, conscious to my thoughts and feelings and recent work on being more transformative and humble in my work, it is true to say lego and other tools similar to this, like plasticine allow people to do that making part, in a much more easier way than sitting with a blank sheet of paper. It takes us back to being a child again, you know that creative little person you used to be, before, for many of us, it was sucked out of us at a young age. Anyway, made me think…a great day, and I wish Tessy all the best of luck on the rest of her journey and thanks for inviting Snook to be there with you.